Looking for top Los Angeles Spas? Wi Spa offers an extensive treatment menu, signature sauna rooms and complete amenities any time of day. Like many gems along the Wilshire Corridor in Koreatown, Wi Spa is a hidden oasis among the neighborhood high-rises. What lies in what appears to be an office building is 48,000 square feet of relaxation and renewal no matter what time it is. Begin your experience on a gender-specific level, melting your stress away by soaking in one of three tubs—hot, warm, cold—relaxing in the steam room or sauna. If you’ve scheduled it, this is where your attendant will find you for your Buff & Massage, the signature of many treatments—massage, acupressure, skin care, and many more—offered at Wi Spa. During the Buff & Massage a traditional Ajuma (female Korean spa attendant) exfoliates your whole body with scrubbing mitts, which assist in detoxification, blood circulation and overall skin health. During the 90-minute treatment you are scrubbed, rinsed with warm sheets of water, massaged with essential oils and additionally pampered with a cucumber mask and hair wash.
Continue your experience by napping in a quiet sleeping room, relaxing in the lounge or, for a more communal experience slip into the T-shirt and shorts provided by the spa and head up to the “jimjilbang” level. Here you’ll find five sauna rooms, a Korean restaurant serving traditional Korean specialties, flat screen TV and play area for children. 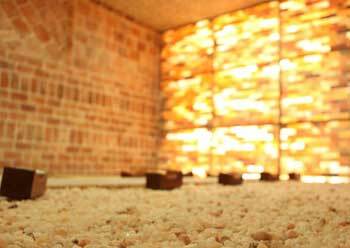 Each of the five saunas on the jimjilbang level address different needs of your body. The Bulgama Sauna, set at 231 degrees, helps remove your body’s toxins; while the Salt Sauna cleanses your pores and helps alleviate skin ailments with the help of thousand-year-old minerals such as calcium, magnesium, iron, sodium and selenium. The Clay Sauna features clay imported from Korea and assists your body in heavy metal detoxification. The Jade Room helps lower the cerebral temperature and massages the brain and balance hormones. End your tour at the Ice Sauna to lower your core body temperature and tighten your skin.